This is Part 2 of the ‘Where Are They Now?’ series. Hopefully you find this interesting! When profiled, Herivaux had signed a Homegrown Player contract at New England Revolution and made his senior professional bow in a US Open Cup match against the Charlotte Independence. 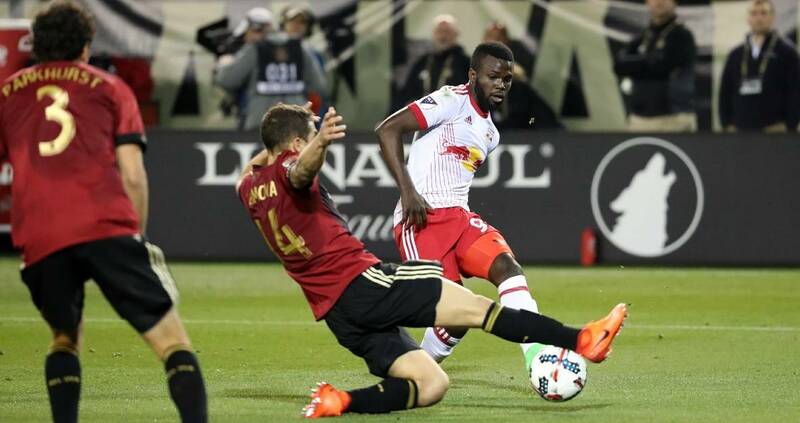 Made MLS debut on 20th March 2016, came off the bench in the 86th minute to replace Scott Caldwell in a 0-3 defeat at home to Philadelphia Union. Netted first goal as a pro three months later in the fourth round of the US Open Cup. A super strike on the edge of the box that turned out to be the game-winning goal in extra time against Carolina RailHawks. Included in Chipotle MLS Homegrown squad – comprised of former MLS Academy players who play for senior level MLS teams in the United States and Canada – for their game vs Mexico’s U-20s at Avaya Stadium in San Jose, California last summer. Played 73 minutes in a 0-2 loss. Didn’t make another MLS appearance until August, managing 10 minutes off the bench in a 1-4 loss to Toronto FC. Completed loan transfer to USL side San Antonio FC on 21st April 2017 joining Turks & Caicos Islands captain Billy Forbes at the club, in a bid to secure more game time having been used sparingly as a substitute for the Revolution. Made USL debut just four days after signing, playing the full 90 as a right winger (Herivaux is nominally a defensive midfielder or versatile defender) against Seattle Sounders 2. Scored in stoppage time in his second game for San Antonio – his second goal as a pro – as a substitute against Portland Timbers 2 last Friday. Was named in Haiti’s 40-man provisional squad for the Copa America Centenario, but yet to break into the Haitian senior team having played at the U-20 and U-23 age levels. Hit the ground running in 2016 with 4 goals in the Caribbean Club Championship first round – vs Atlantico (2), CS Moulien (1) and Inter Moengotapoe (1). Featured throughout Connection’s CONCACAF Champions League campaign as they finished bottom in a group consisting of Honduras Progreso and UNAM. Scored in the opening game, a 2-4 defeat to UNAM. Reached double figures (10) for goal-scoring tally in 2016/17 TT Pro League season including a hat-trick against Club Sando. Scored in three straight games after that hat-trick, including game-winning goal vs St Ann’s Rangers. Connection narrowly missed out on the title to rivals Central FC, who lifted the trophy for an historic third time in a row. Played in five games for Grenada during 2016 and registered three goals – vs Trinidad & Tobago (1), Sint Maarten (1) and Antigua & Barbuda (1). The Spice Boyz crashed out of Caribbean Cup qualifying last summer. Appeared in his country’s 2-2 draw with Trinidad & Tobago at the Kirani James National Stadium last Saturday, helping Grenada stretch their unbeaten run vs T&T to 8 years. Antoine Furet wrote in his profile of Lowe that “he has the desire and build to be a starter in MLS” and while this is still very much possible, the central defender has had to be a little more patient than perhaps he was expecting by dropping down divisions. Was announced a couple of months after being profiled that Lowe was training with North American Soccer League side Minnesota United in their preseason tournament in Portland. Officially signed on a season-long loan in March 2016. Netted his first goal for Minnesota a month later, heading in from a corner against Fort Lauderdale Strikers. Subsequently made the NASL Team of the Week selection. Scored his second of the season in a game with Indy Eleven, again from a corner. Made the NASL Team of the Week selection for a second time in October. Told by Seattle Sounders in December that he wouldn’t be having option exercised in his contract, despite performing strongly for Minnesota. He played 27 games (25 starts) and registered 2,241 minutes. 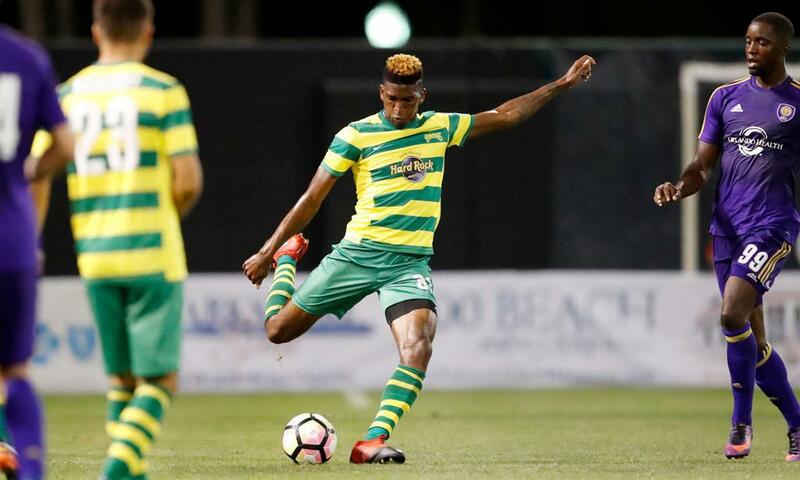 Signed with USL club Tampa Bay Rowdies in January earlier this year and got on the score sheet in a 4-0 rout of Toronto FC 2, again showing his strength in the air by heading in a cross. Made senior debut for Jamaica in a Caribbean Cup qualifying victory over Guyana in October 2016. Was red carded in the first half of his second game for the Reggae Boyz against Suriname for a stamp. Jamaica won 1-0 despite having one man less, securing qualification to the Caribbean Cup and Gold Cup this summer. Included in the Jamaican squad that faced the US (L 1-0) and Honduras (W 1-0) in a friendly series in February – scored the game-winning goal vs Honduras after finishing from close range in the 71st minute. Has described getting into his country’s Gold Cup squad as a “priority“. Formerly on the books of Aston Villa having been sent out on loan to various lower league clubs such as Tranmere Rovers, Wycombe Wanderers and Newport County. Extended his stay at Newport not long after being profiled. Was compared to former West Ham and England World Cup-winning captain Bobby Moore by Newport coaching staff. Joined Accrington Stanley in League Two on non-contract terms in August 2016 following his release from Villa. Accrington fielded Donacien as an ‘ineligible player’ in their League Two game with Doncaster Rovers and EFL Cup clash with Bradford City. The club failed to obtain international clearance for him but they escaped a points deduction and tangible fine. Signed a contract with Accrington until end of the season in August. Been a regular starter throughout the 2016/17 campaign, helping his club secure survival in League Two. Put pen to paper with Charleston Battery in the USL a few months after being profiled, along with compatriot Ataullah Guerra. Has continued development at the Battery, who are known for investing in Caribbean players – they have 8 in their squad including Hackshaw. Scored first Battery goal in early March and then bagged another two weeks later. Made substitute appearance in Trinidad & Tobago’s Copa America Centenario playoff defeat to Haiti in January 2016. Assisted Levi Garcia for his game-winning goal against St Vincent & the Grenadines in 2018 World Cup qualifying, when T&T won 2-3 in Kingstown. Included in September and November squads for WCQ by former T&T manager Stephen Hart. Left out by new boss Dennis Lawrence in March qualifiers. ‘Taxi’ has been with New York Red Bulls for just over two years now and continues to be the side’s number one left-back. Signed a multi-year contract extension and agreed a “substantial pay raise” in February 2016 amid rumours that a number of high-profile European clubs, including Leicester City, were looking at him. Form dipped a little last term after setting such high standards in his debut season for the club. Briefly deputised at centre-back due to squad injuries. Has started the 2017 season well, bagged assist in 2-0 win over Columbus Crew and scored game-winning goal in 2-1 win against Chicago Fire last Sunday. Was part of Jamaica’s unsuccessful 2018 World Cup qualifying campaign when Winfried Schafer was in charge. Went to the Copa America Centenario but picked up an injury in the opening game against Venezuela and was substituted off for Wes Morgan. Featured in Caribbean Cup qualifying wins against Guyana in October and Suriname in November. Expected to play in this summer’s Caribbean Cup and Gold Cup – if not both, then certainly one. Found it hard to settle at Vancouver Whitecaps after sustaining an anterior cruciate ligament tear in his right knee while on loan at Charleston Battery, meaning he was side-lined for a year. Returned from injury in mid-2015 and represented the Whitecaps USL team, scored 3 goals and made 2 assists in 14 games (11 starts). Signed with Portland Timbers 2 in the USL in March 2016 after leaving Whitecaps. Joined compatriots Michael Seaton, Neco Brett, Rennico Clarke, Jermaine Taylor, Darren Mattocks and Alvas Powell at the Timbers. Netted first goal for his new club a month later, in a 2-0 victory over Tulsa Roughnecks. His shot from just outside the box clipped the crossbar and bounced over the line. Made his senior international bow in Jamaica’s friendly win over Honduras in February earlier this year after representing his country at U-17, U-20 and U-23 level. He scored in a 1-1 draw against France in Jamaica’s final group game at the U-17 World Cup in 2011.